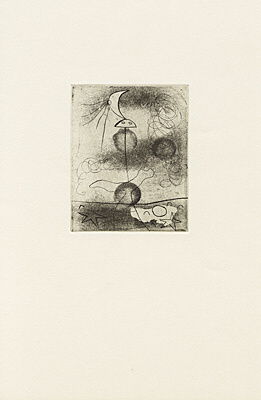 I need an impulse at the beginning  and be it only a grain of dust or a ray of light. 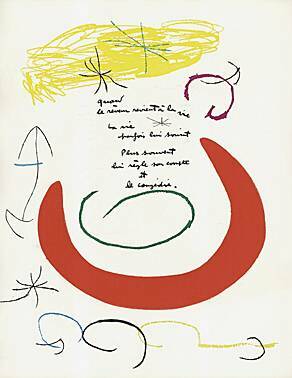 From this form, a number of things grow towards me, from the one emerges the next. 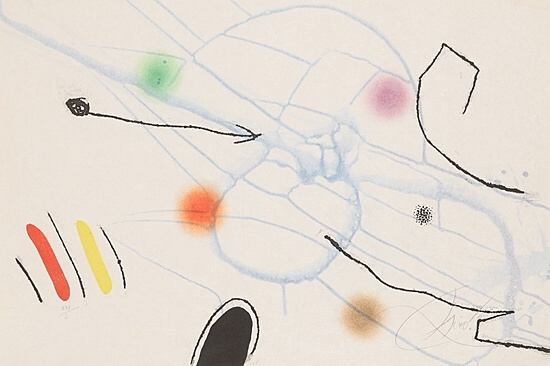 Through a thread, I discover an entire world. And thus, the creative act begins at the moment of seeing. 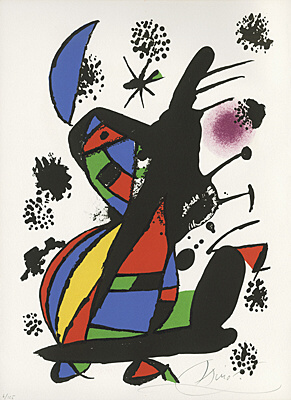 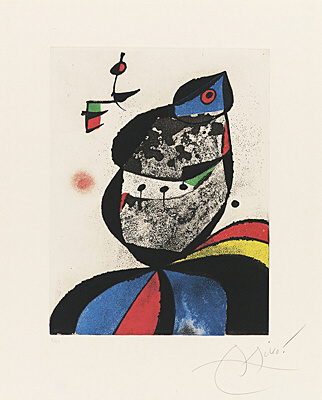 As a painter, draughtsman and printmaker, sculptor and ceramist, Joan Miró (Barcelona 18931983 Palma de Mallorca) created a unique oeuvre and is one of the most important and popular artists of the twentieth century. 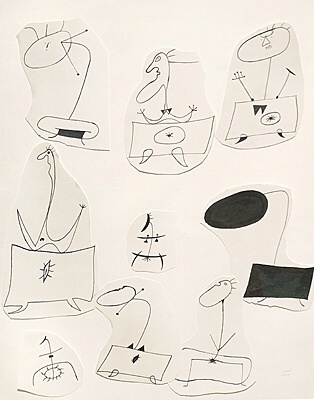 His sign language generates highly individual realities in unlimited fantasy, in which humans, animals and plants, the sun, moon and stars coalesce with each other. 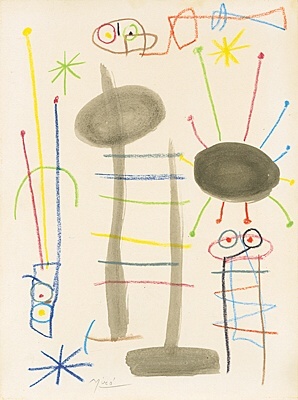 His entire oeuvre is characterised by a thirst for experimentation and inventiveness. 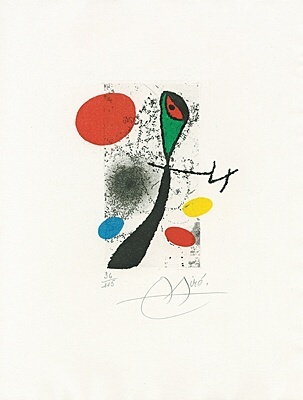 Joan Mirós roots lie in Catalonia. 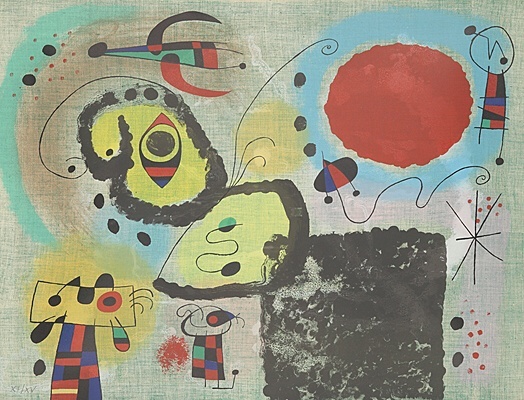 The original landscape of Tarragona was the breeding ground for his art and the source of his imagination. 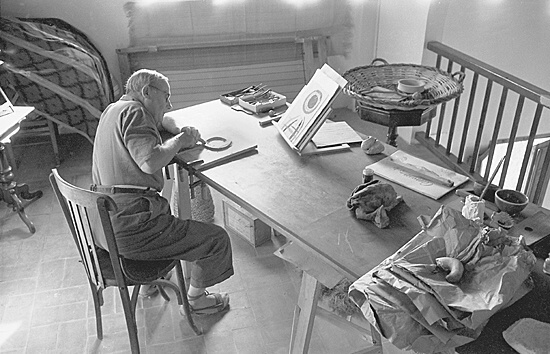 Since his childhood, his parents country estate in Montroig, Catalonia, had been a refuge and source of his strength. 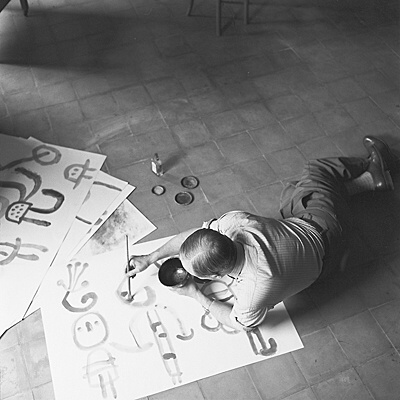 All my works come to my mind in Montroig  only in Montroig. 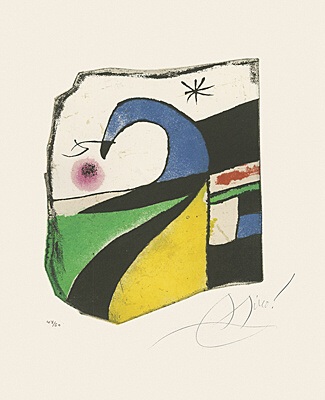 Not in Paris, nor elsewhere. The lush vegetation, the rocks and mountains, the ploughed fields, the beach and the sea formed an inexhaustible reservoir of inspiration and motifs for his art. 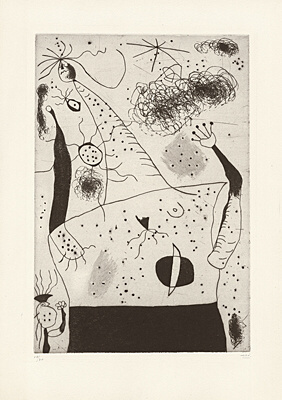 In 1920, he travelled to Paris for the first time. 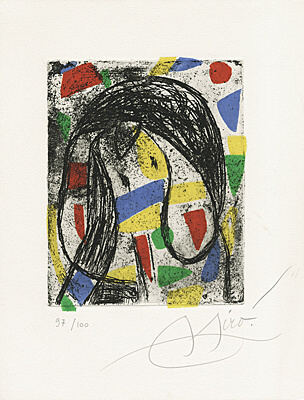 Picasso received him amicably. 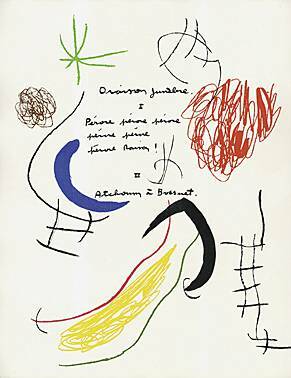 He became acquainted with the Parisian avant-garde art scene, including Max Jacob and Tristan Tzara, made friends with Henry Miller, Jacques Prévert, Ezra Pound and Ernest Hemingway, who later bought the farm. 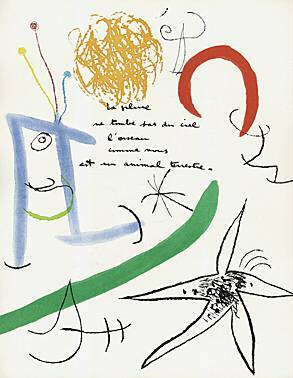 He met Paul Eluard, Louis Aragon and André Breton and joined the Surrealist movement. 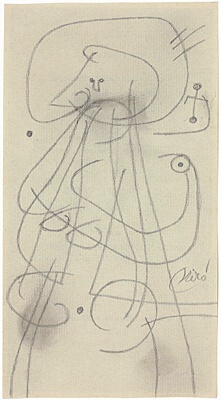 192425 marks a decisive turning point in his work. 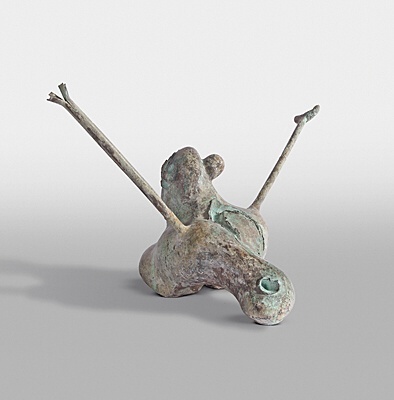 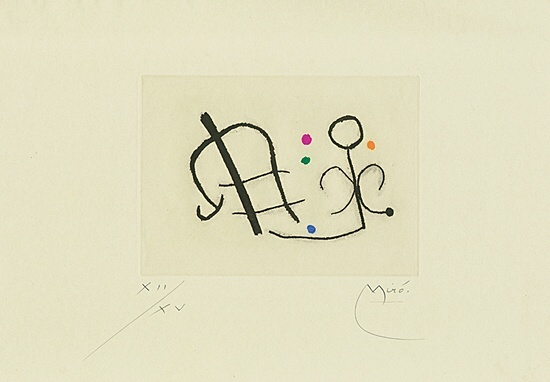 The new works, in which the object becomes a sign, were exhibited at Galerie Pierre in Paris. 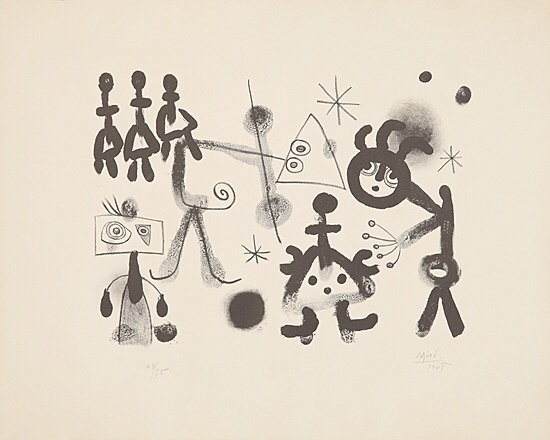 His goal of developing a new and individual pictorial language and breaking the conventions of painting caused excitement. 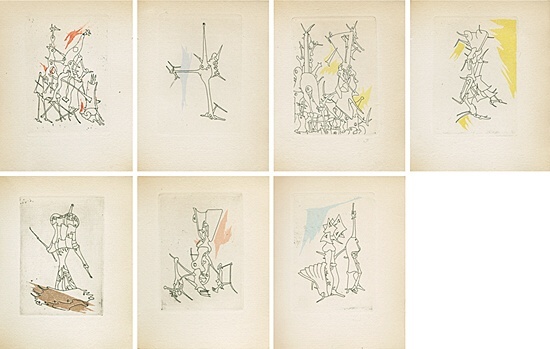 In 1926/27, together with Max Ernst, he designed the stage design for Romeo and Juliet for Diaghilevs Russian Ballet. 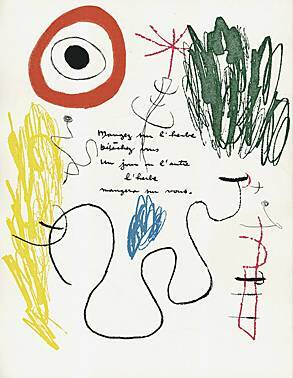 He moved into a new studio in Montmartre. 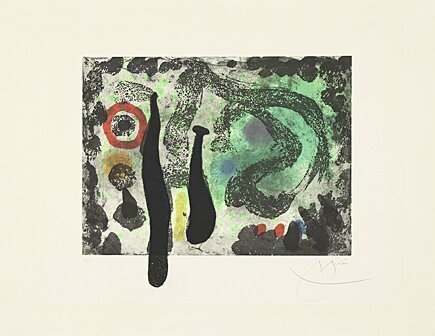 His neighbours were Max Ernst, Paul Eluard, René Magritte and Jean Arp, with whom he met and conversed on a daily basis. 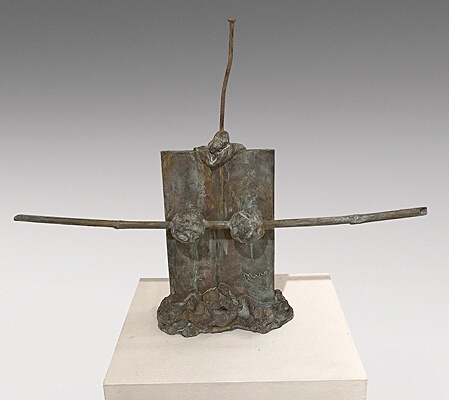 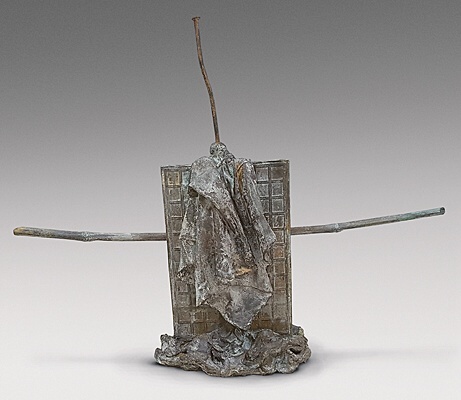 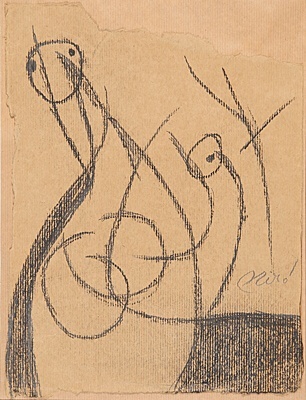 In 1928, he met Alberto Giacometti and Alexander Calder. 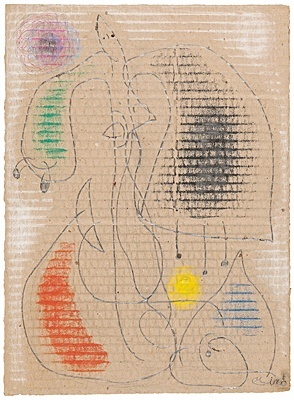 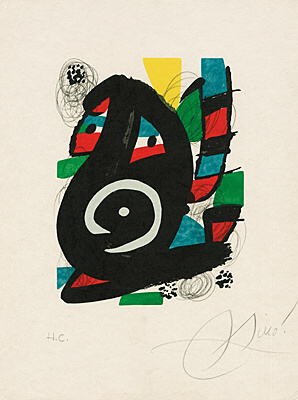 The exhibition at Galerie Bernheim ensured that Miró was now on everyone's lips. 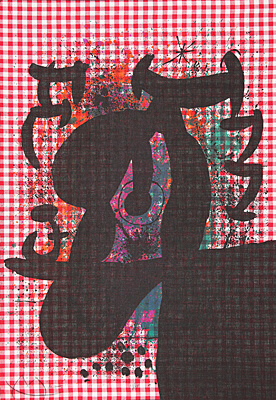 All forty-one works on view are sold. 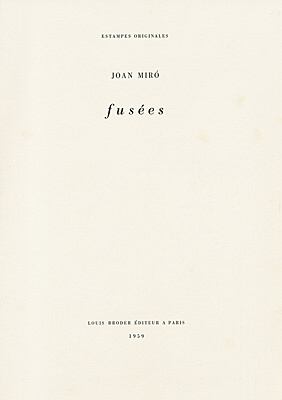 In October 1929, he married Pilar Juncosa in Palma de Mallorca. 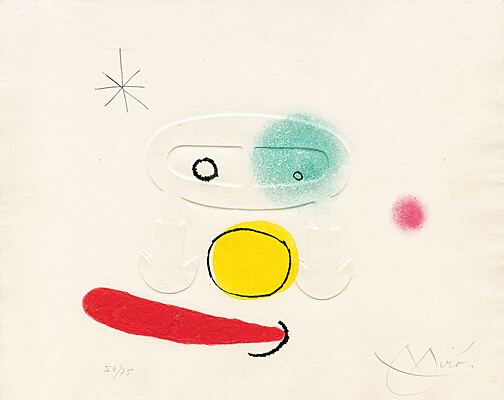 His only daughter, Maria Dolores, was born in 1930. 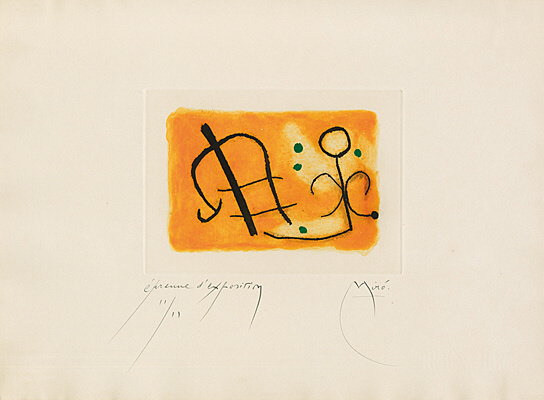 In 1932, Pierre Matisse Gallery in New York exhibited his most recent works. 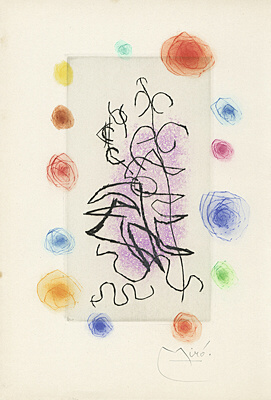 In 1934/35, he met Kandinsky, whose writings he appreciated and whose charisma impressed him. 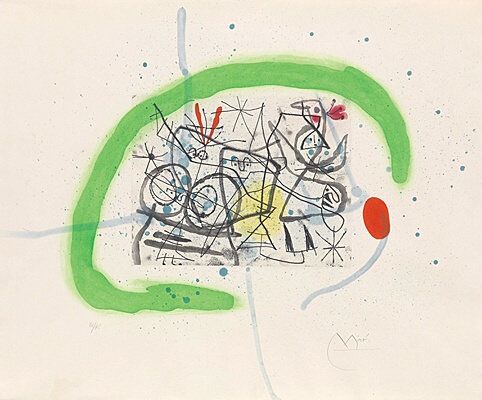 Exhibitions followed in San Francisco, Chicago, Los Angeles and again in New York. 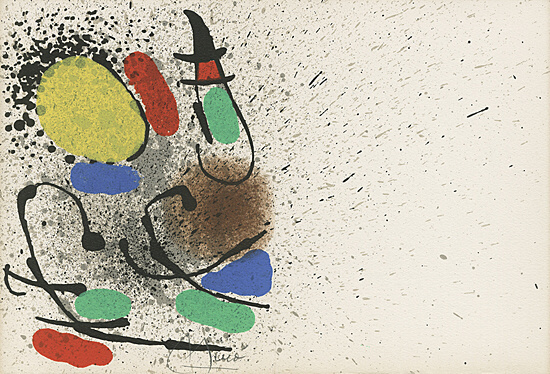 In 1936, civil war broke out in Spain. 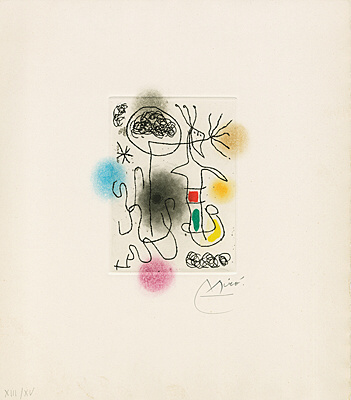 Miró decided to leave the country. 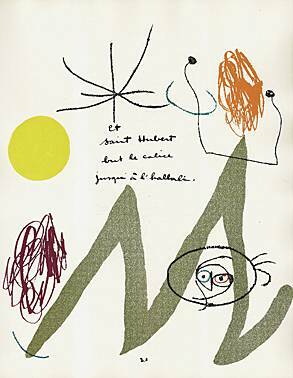 Together with his wife and daughter, he lived modestly in the Montparnasse district. 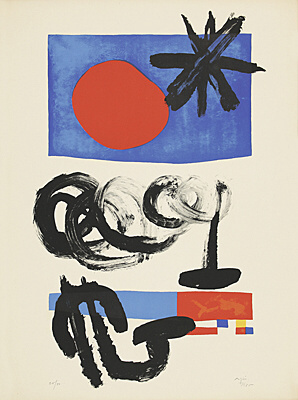 In 1937, he designed a poster for the pavilion of the Spanish Republic. 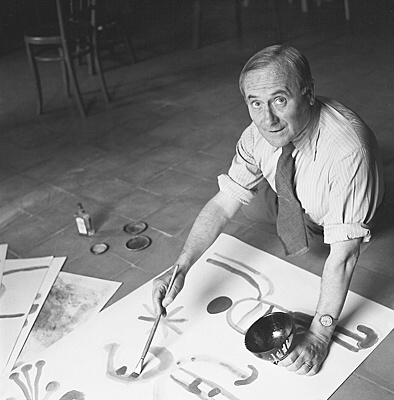 In 1940, he fled from the German troops and returned to Spain, first to Palma de Mallorca and Montroig, and later to Barcelona. 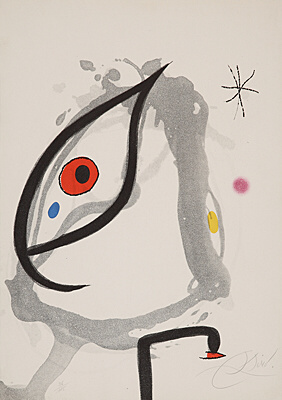 In 1947, he travelled to New York for the first time, where he rented a spacious studio. 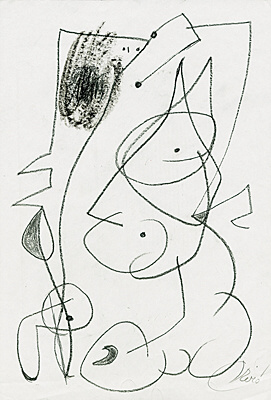 In Stanley Hayters Atelier 17, where he met, among others, Jackson Pollock, he made a number of important etchings. 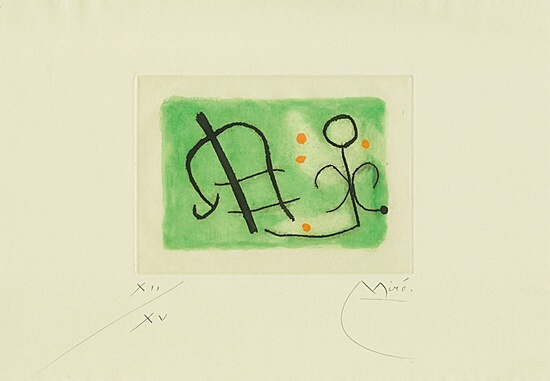 At Galerie Pierre Matisse, works of the last years were shown. 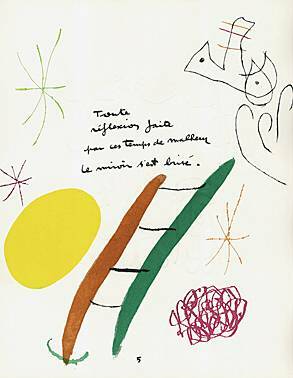 In 1948, he returned to Paris after eight years. 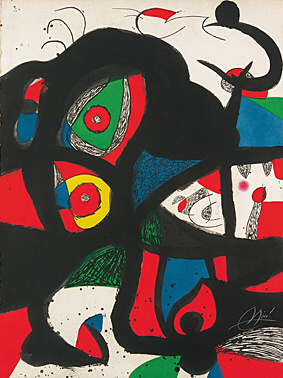 In 1956, he left Barcelona and settled in Palma de Mallorca, where Josep L. Sert set up a large studio for him. 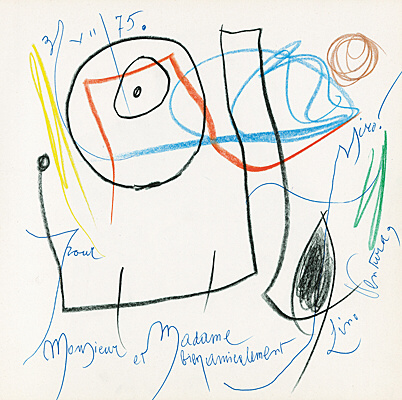 In 1974, the City of Paris dedicated a major retrospective to him at the Grand Palais. 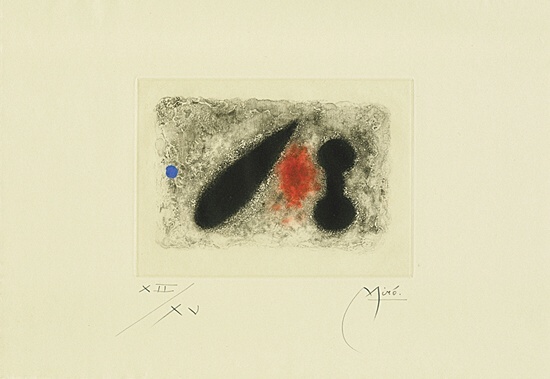 In 1975, the Fundació Joan Miró was opened in the park of Montjuïc. 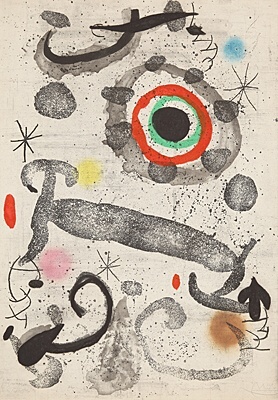 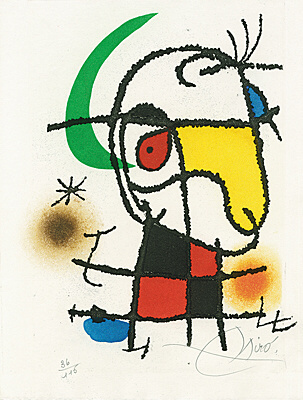 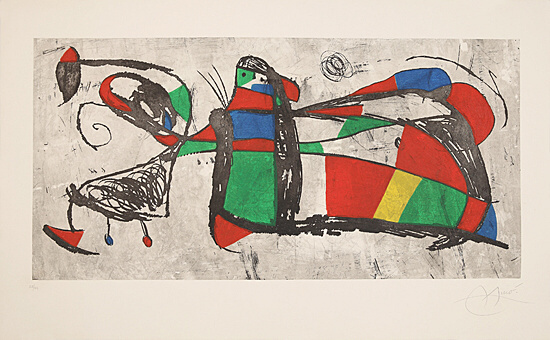 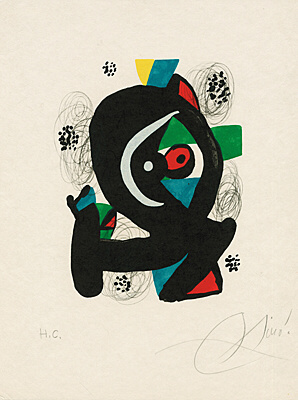 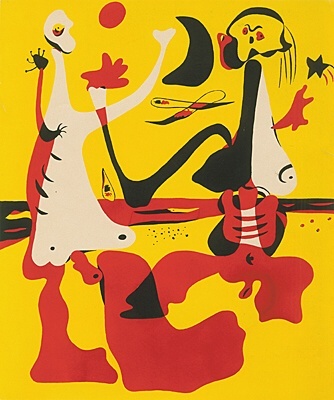 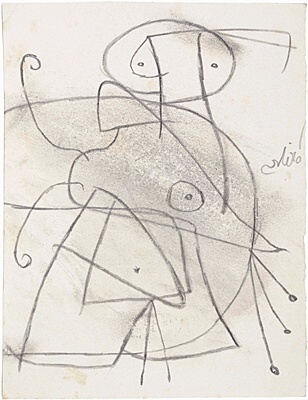 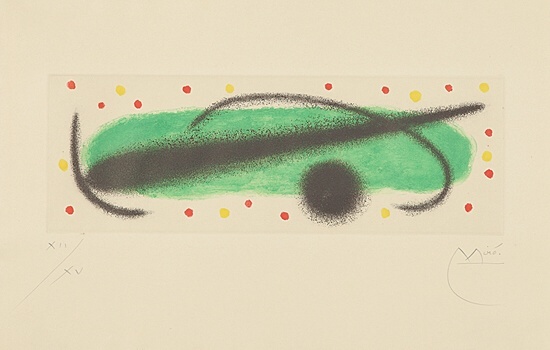 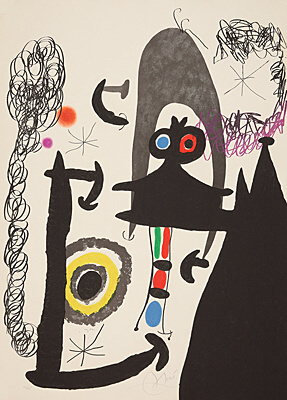 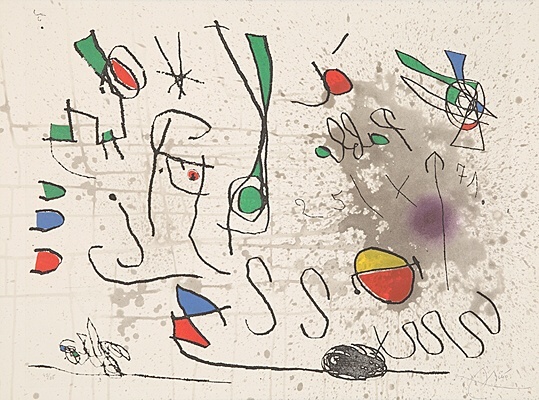 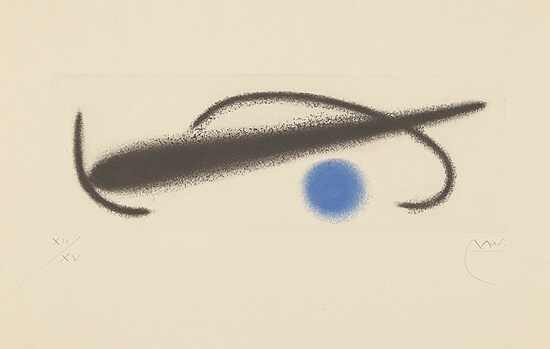 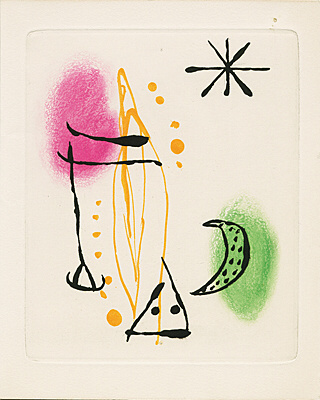 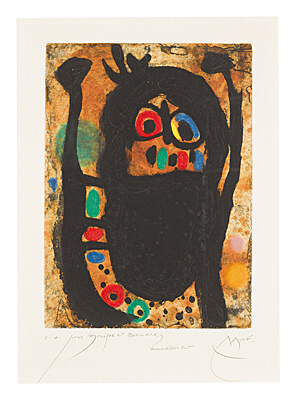 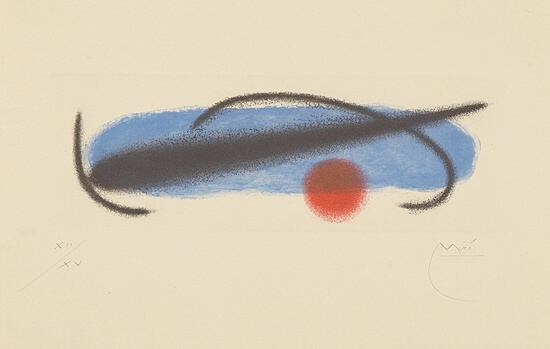 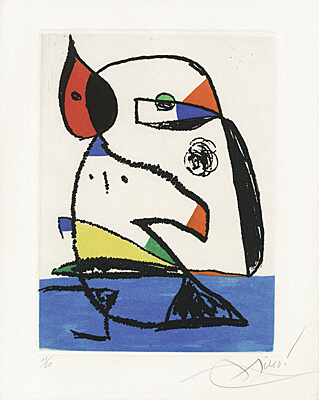 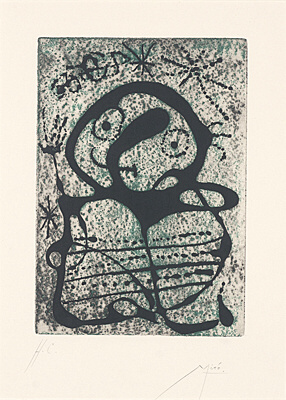 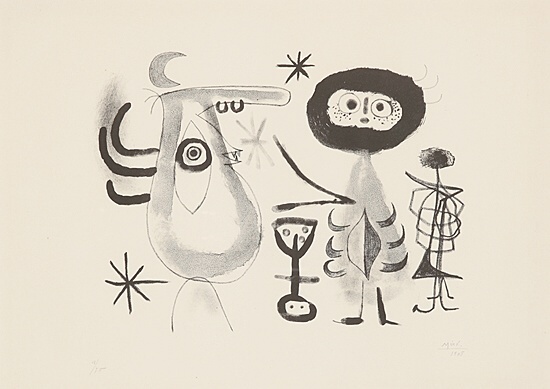 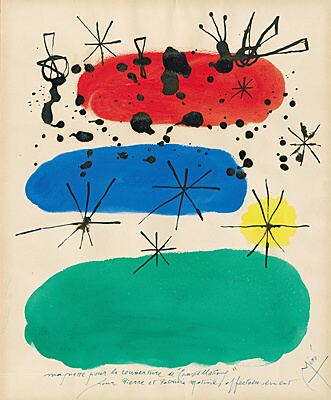 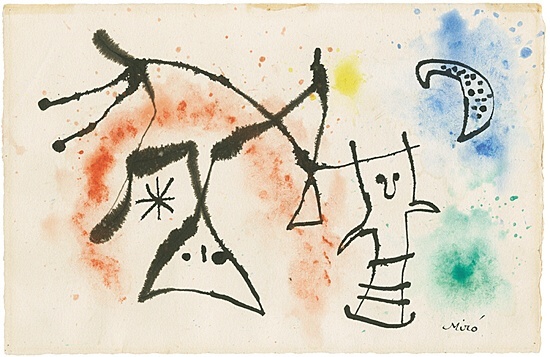 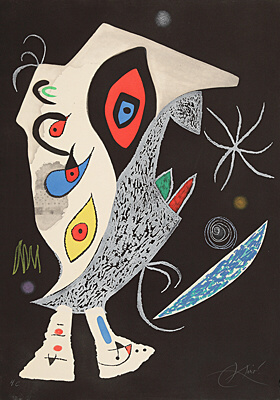 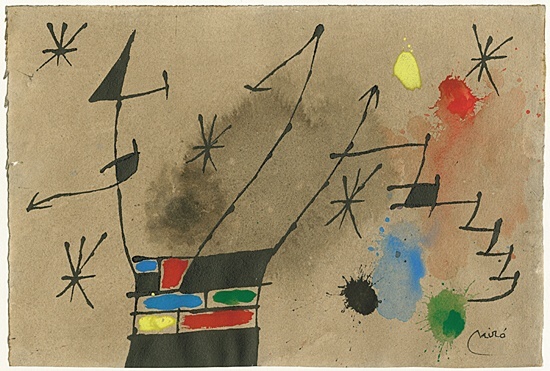 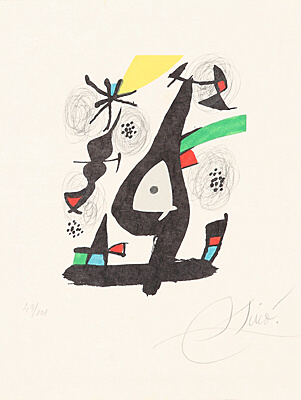 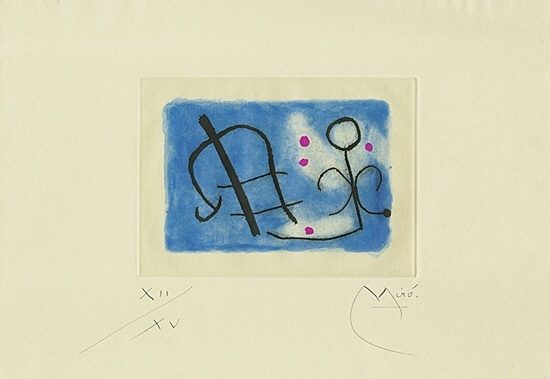 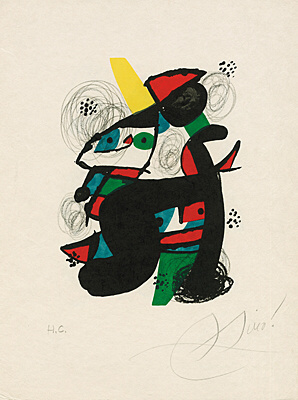 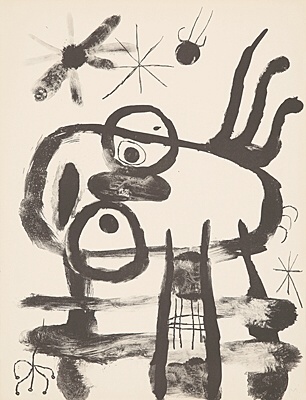 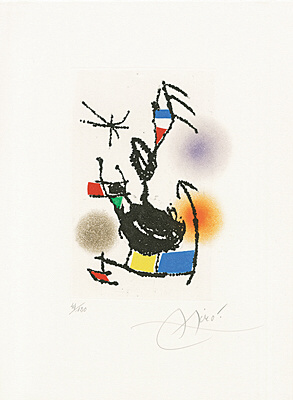 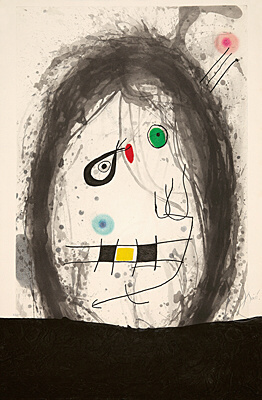 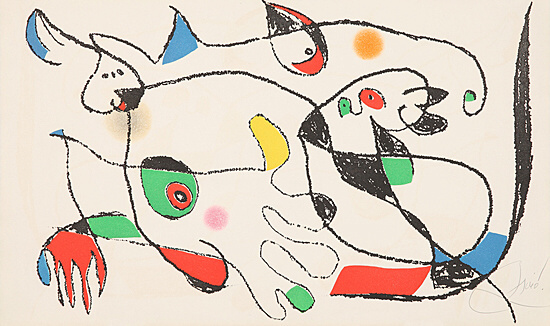 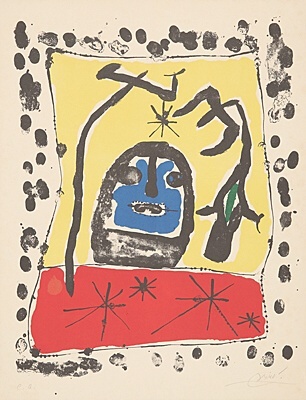 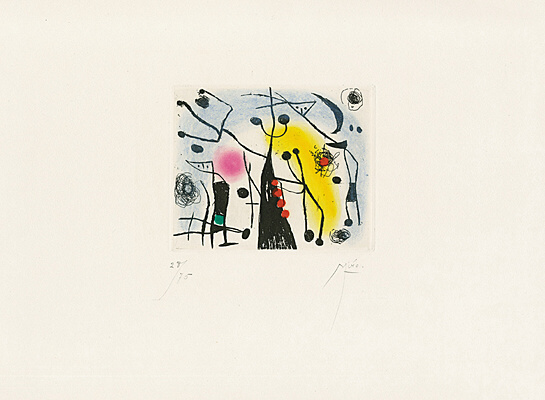 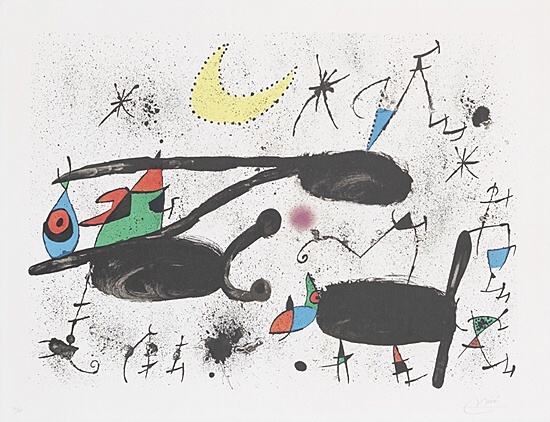 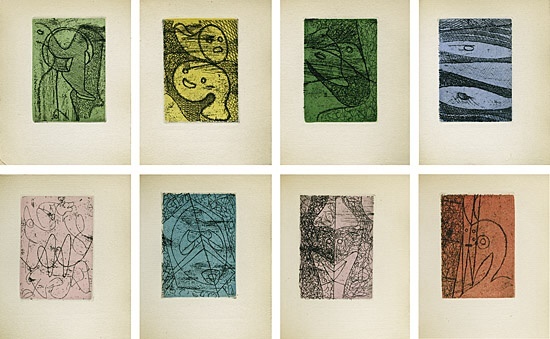 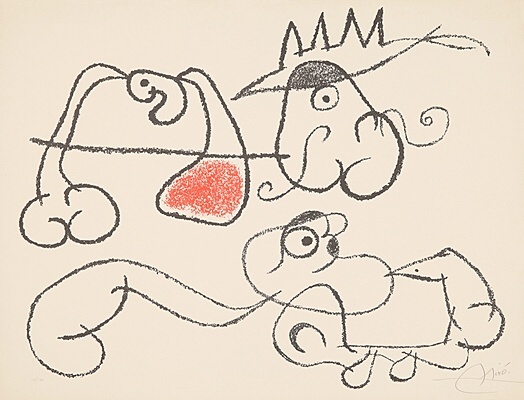 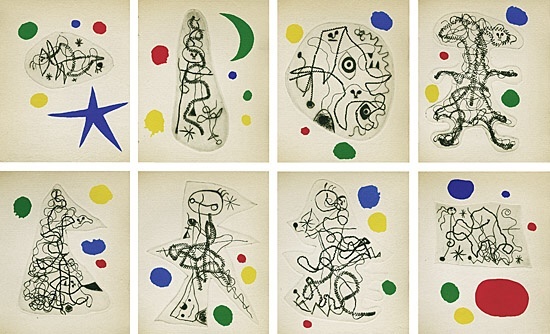 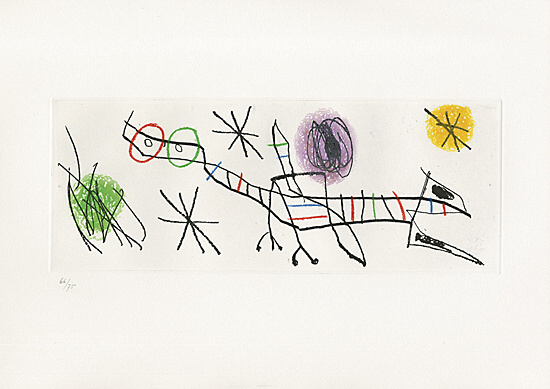 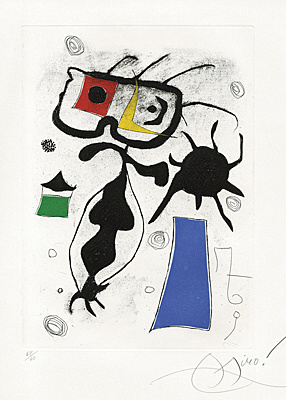 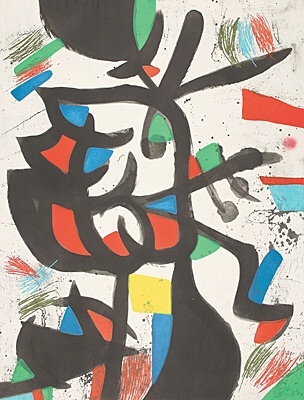 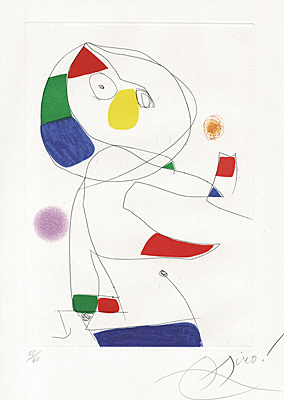 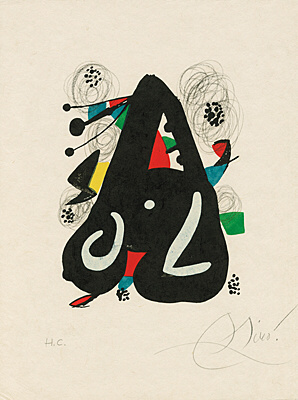 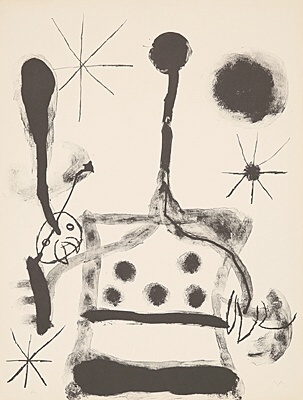 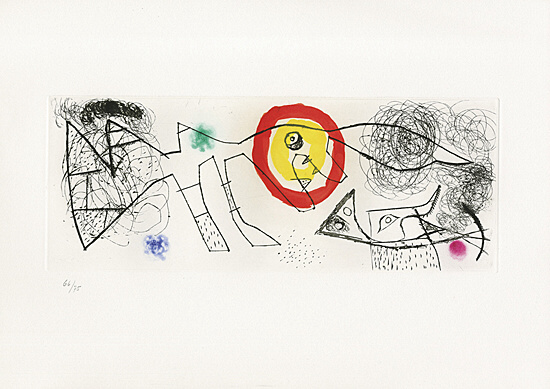 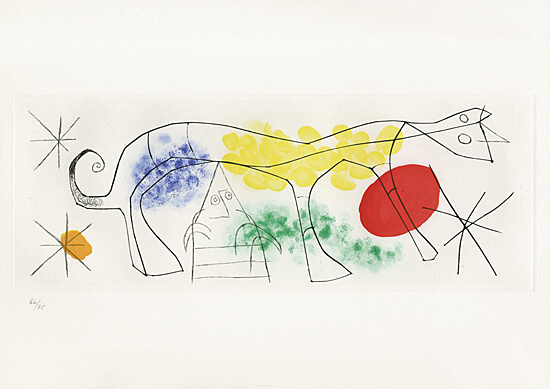 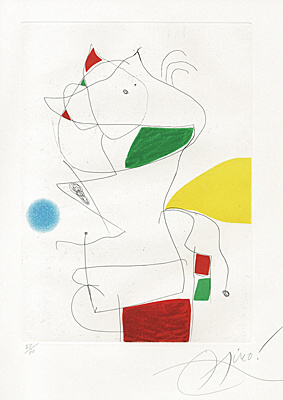 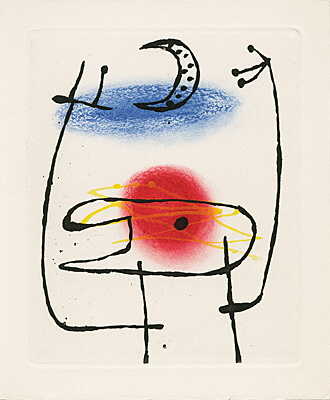 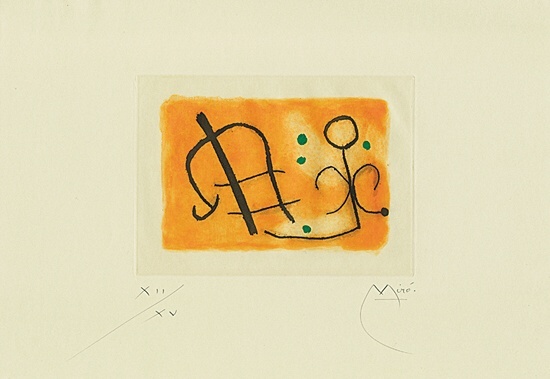 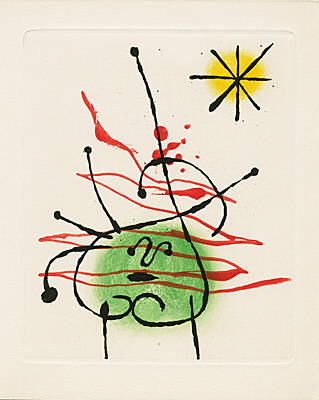 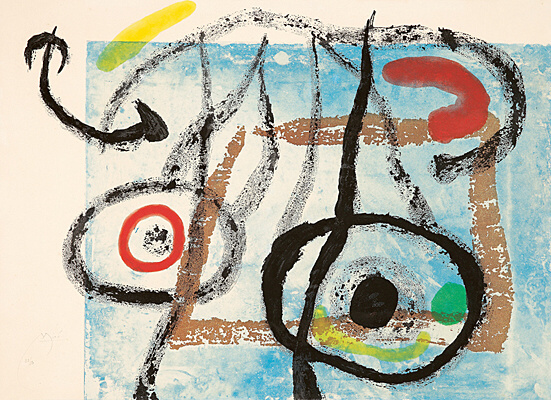 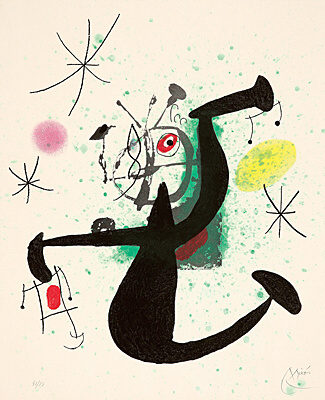 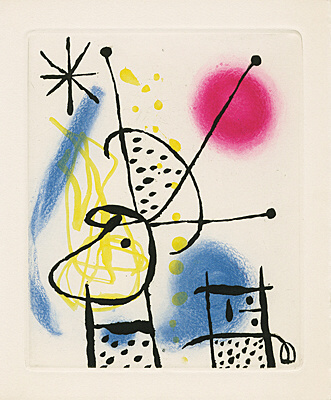 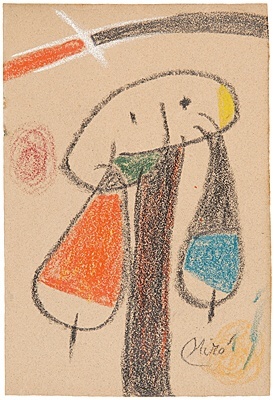 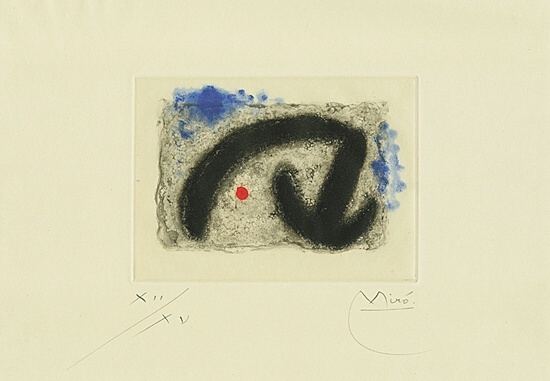 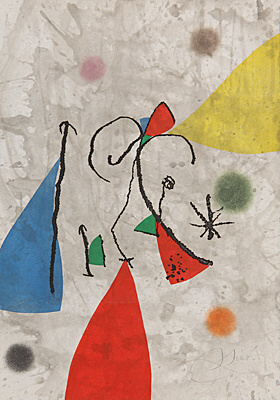 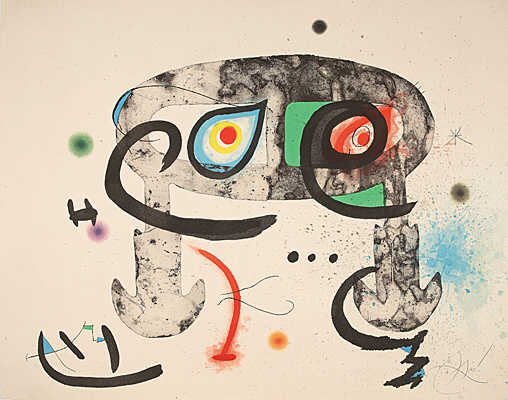 It is less known that Miró was not only a painter but also a passionate printmaker. 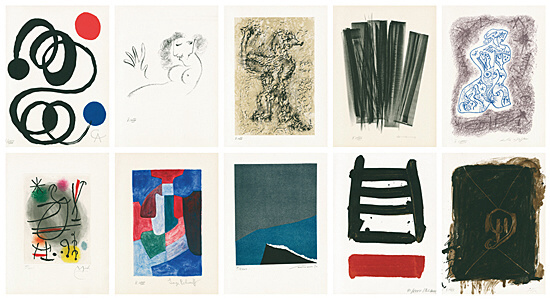 The catalogue of his prints contains over 1,300 etchings and more than 1,200 lithographs. 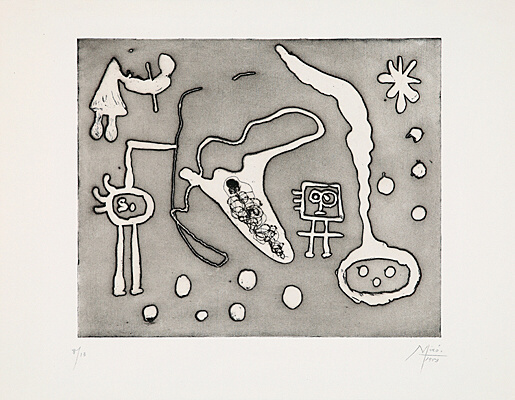 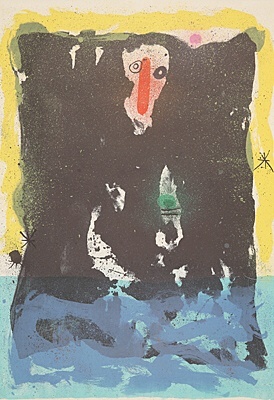 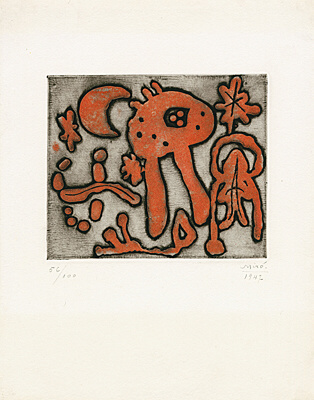 His print oeuvre is also characterised by a fascinating spectrum of pictorial means, which are marked by their diversity, inventiveness, experimentation and the use of various techniques. 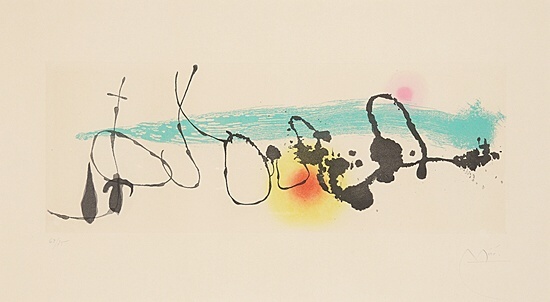 An extraordinary formal language and the colourfulness of his works demonstrate the creativity of an artist whose style is absolutely unmistakable. 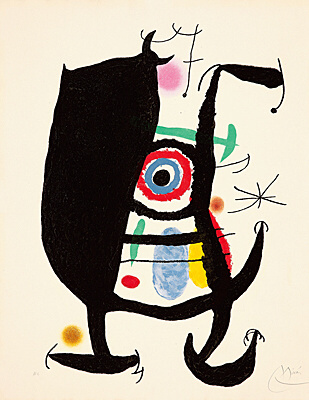 Miró was well-read. 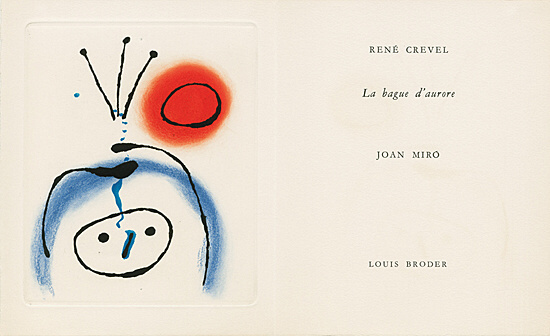 When he died in Palma in 1983, his library contained 1,700 books. 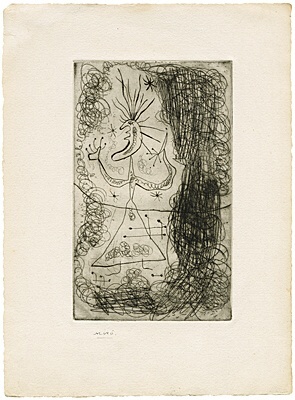 And it is thus hardly surprising that, although he was inspired by the works of his fellow painters, he sought and appreciated the closeness of literary figures and philosophers. 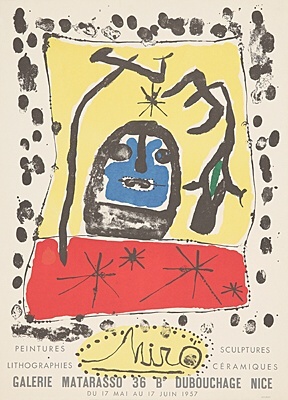 A total of 258 illustrated books were produced in collaboration with the most important writers and philosophers of the twentieth century. 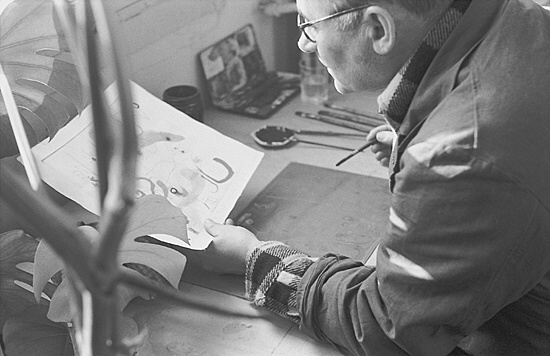 He created his very first illustrated book as early as 1927. 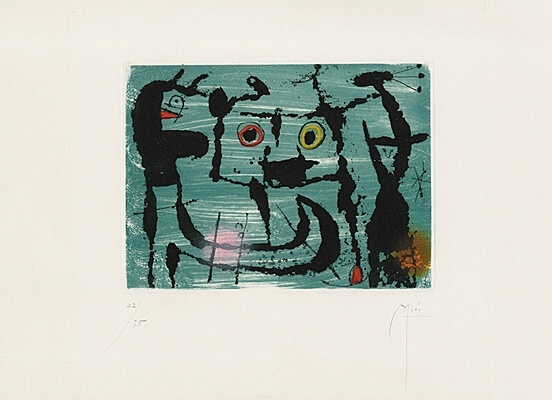 In 1954, he was awarded the Grand International Prize for Graphic Work of the Venice Biennale. 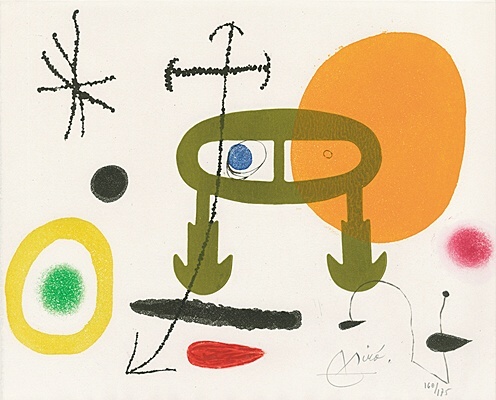 Until his death, Mirós life was marked by an untiring urge to create, as well as by exhibitions in all the larger and smaller institutions of the world, honours, award ceremonies and commissions.